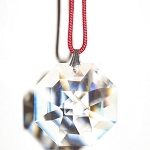 Swarovski Bagua Wealth Hanging Crystals will increase prosperity. 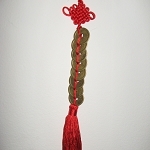 Its unique design represents the Feng Shui Bagua map while giving a special energy charge for the wealth area. 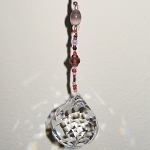 28 mm Swarovski Bagua (octagon) Crystal on gemstone hanger. This faceted Bagua shaped genuine Austrian Swarovski crystal is hanging from a string of smaller crystals and beads including clear faceted 4mm genuine Austrian Lead Crystals by Swarovski, and an 8mm Aurora Borealis (rainbow effect) genuine Austrian Lead Crystal by Swarovski. All faceted crystals clear a room of negative energy replacing it with positive energy, deflect negative energy, and protect you from poison arrows (a form of negative energy) and harm. Includes gold and purple colored beads, representing Feng Shui Wealth and Prosperity. Beautiful and elegant enough to be hung in your formal dining room. 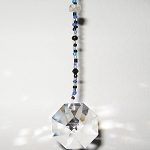 The hanging Swarovski crystal is Bagua shaped to represent the Feng Shui Bagua map. The Bagua shape symbolizes harmony and fulfillment. The Bagua shaped genuine Austrian Lead Crystals by Swarovski are marked with the Swarovski logo. Each hanger is completely unique, fully hand strung, and filled with the artist's intention of wealth and prosperity to those who hang it. Perfect for a car's rear view mirror. Total length around 13 inches. Exclusive to Zen Appeal!